Towards the completion of their master’s degree in International Management and Leadership, the IML 2014 students had the opportunity to discuss a variety of managerial concepts and thoughts touching on the personal, social, and organizational level with highly experienced industry practitioner Mag. Georg Gruber, MBA. Mr. Gruber taught a course at LBS as part of the Issues in Management visiting professorship series. Mag. Gruber shared rich insights from his long-standing career, which included senior management positions both in large corporations and in the non-profit sector. After gaining a master’s degree in business informatics at the Kepler University of Linz and an MBA at the University of Oregon (as a Fulbright scholar), Georg Gruber pursued an international management career at Procter & Gamble. He was posted for several years to London, Paris and Brussels, and was responsible for the company’s CEE HR operations. Subsequently, Mag. Gruber moved into banking, where he headed Bank Austria’s HR department. 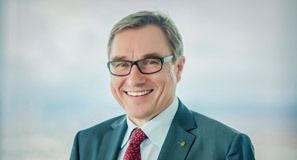 His current position is Managing Director of Raiffeisen Campus, the training institute of the cooperative Raiffeisen Banking Group. Moreover, Mag. Gruber acted as executive manager and board member of Fairtrade Austria. With a global turnover of over 3 billion Euros, the Fairtrade model can be regarded as a laboratory for shaping global trade in a sustainable as well as a socially and ecologically fair manner. Fairtrade Austria closely cooperates with Austrian business partners, the Austrian Development Agency (ADA) and the media to promote its poverty fighting cause. What is more, it collaborates with disadvantaged small holders and agricultural producer organizations in over 50 countries of the Global South. Based on their previously gained theoretical knowledge, this class exposed LBS students to models and practical methods of successfully managing both a training company for regional banks and a globally acting non-governmental organization. Mag. Gruber placed particular emphasis on exploring the personal values associated with managerial work, understanding organizational behavior/culture, and reciprocity in initiating and influencing relationships in a business environment. The Issues in Management visiting professorship invites outstanding business practitioners and internationally renowned academics to challenge and inspire students with novel ways of thinking and acting.